Light therapy may help alleviate oral mucositis experienced by cancer patients undergoing chemotherapy or radiation therapy. A team at the University at Buffalo (UB) will determine the effectiveness of photobiomodulation in the prevention and management of oral mucositis, as this technology has the potential to replace opioids in the treatment of the health condition that can impede cancer treatments due to debilitating oral pain. Image by Douglas Levere, University at Buffalo. The collaborative study between the UB School of Dental Medicine and the departments of Radiation Medicine and Oral Oncology at Roswell Park Comprehensive Cancer Center will use the technology to test its effectiveness and determine the proper dosage to stimulate healing in oral tissues damaged by cancer treatment. Cryotherapyand practicing good oral hygiene are key components in preventing oral mucositis; however, many people receiving cancer treatment will experience this health complication. Oral health professionals are well-versed in recommending management treatments to counter side effects from chemotherapy and radiation, which include oral mucositis, xerostomia, and oral candidiasis. 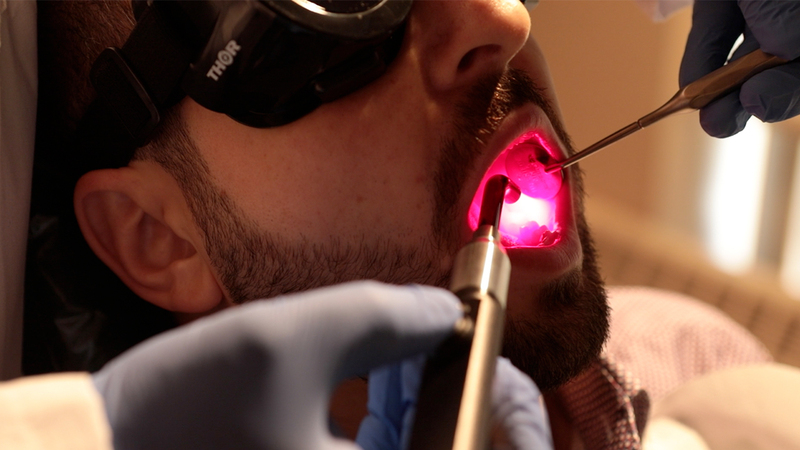 MuReva Phototherapy’s light technology consists of a mouthpiece that can be self-administered, simultaneously targeting a much larger portion of the oral cavity and delivers a full treatment in 6 minutes or less. The current method for low-light therapy delivery requires a medical professional to spend 30 minutes per patient per day, according to the company. “Oral mucositis is largely self-limited and stopping cancer treatments (chemotherapy or radiation) usually helps resolves this extremely painful condition. However, while the local tissue can heal well, the long-term impact on the cancer is compromised due to treatment interruptions. This can have deadly consequences,” he says. A consensus on proper dosage for the treatment has yet to be reached, Arany points out, adding that this will be examined in the UB study. U.S. Centers for Disease Control and Prevention. Mucositis. Available at: https://www.cdc.gov/nchs/ppt/icd9/att_mucositis_sep05.ppt. Accessed February 21, 2019.